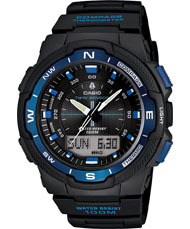 The Casio SGW-500H is a brilliant watch, it has some amazing features that I will explain in this review, there are also some down sides which you will want to know about. There are two versions of this watch, the SGW500H-1BV which has red highlights and the sgw500h-2bv which has blue high lights. I prefer the blue, its a little more classy and subtle. Overall I love this watch. I love the fact I can wear it everyday, its comfortable, not too big, it doesn’t get snagged on clothes or objects easily. It looks nice in a suit but can handle a holiday. I wear this watch everyday, and its never let me down. All modern watches keep accurate time, that is a given now, but this watch does that, whilst looking and feeling good and has the added bonus of compass. The temperature gauge works, but just like the other watch temp gauges, its measuring a combination of the wearer’s wrist temperature and the air temperature, which is fairly meaningless. You can take it off and let it adjust to the air temp, but really whats the point? I have manually adjusted mine so that when I’m wearing it, it gives me a reasonable idea of the air temperature, but its not accurate. 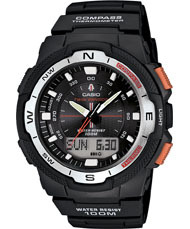 The strap is classic plastic Casio affair, its comfortable and has a wide range of adjustments. Its plain, which is good, there is no silly bright branding or writing. The glass face of the watch has not scratched so far, and this is after 6 months of hard use, 2 holidays, numerous DIY incidents, gardening etc. Another useful feature is the sunset calculation, now being a Muslim, its nice to know when is sunset and sunrise, and this watch will calculate both. Its a simple matter of clicking a button and it just tells you on screen when is sunrise and sunset. Now within the Muslim world there is always some debate as to when exactly these two events occur, but the watch gives a guide and you can work out your adjustment accordingly and say add 5 minutes or 10 minutes according to your scholar. I find it underestimates slightly, so say if maghrib time is 7pm, the watch says 6:50pm, so I tend to add 10 minutes. This may be that the long and lat settings I used for my exact location are slightly wrong, and in reality, who cares, its just giving a gauge, not an exact report. The same approach is true for the moon age, again, you click the lower left button and cycle through to moon age and it tells you how old the moon is. I’m not sure how this is worked out, it seems to work surprising well, and if anything is slightly early. Again, I would not use this as my only source of information, but if you just wanted to know roughly what part of the lunar cycle are we in, it works well. Compass needs re calibration from time to time in order to stay accurate, I found monthly, or if I really wanted to be sure its right, I would calibrate. It only takes a minute, so its not a big deal, but it is annoying to have doubt in the compass. If you want to know anything specific about this watch, just add a comment and I will try to answer. Can it be converted in to metal bands..because i need all these functions in metal band watch. I love the watch have the bleu and black version both. Look are good andere the compass is accurate. The chance vrij summertime tot wintertime without DST is easy. The glass is too easy to scratch. I read somewhere that it is not the high quality quartz.